Ecologist Will Miles said initial research of great skua preying on Leach's petrel on St Kilda found the behaviour was unlikely to be common. The National Trust for Scotland (NTS) has been recording "alarming" falls in the smaller petrels on the islands. NTS said the Leach's petrel colony on St Kilda, which it owns, is the largest in Europe and numbers about 40,000 pairs. Results of this year's work are still being analysed, however, Mr Miles revealed some intriguing insights into the bonxies' behaviour. He said: "The skuas are highly active on the petrel colonies at night and catch petrels in a variety of ways - both on the ground and in the air. 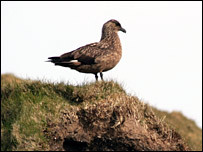 "Nocturnal foraging by great skuas is thought to be quite a rare situation. "At least, it has not been widely reported from the most intensively studied skua colonies on Shetland or from elsewhere across the species' breeding range. "The situation on Kilda seems rather unique in this respect." Mr Miles said: "Skuas are highly opportunistic predators and some individuals seem to develop a taste for certain prey types. "One possibility may be that on Kilda the petrels are a relatively abundant prey type, a few individual skuas have exploited this situation opportunistically and their behaviour has been copied by others looking for an easy meal." 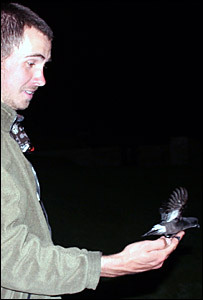 Mr Miles said: "Once on-site, we then stayed put in one watching position for the hours of darkness and just observed the bird activity." Mr Miles said: "The call of the shearwaters is particularly evocative and bizarre - sometimes likened to a chicken with asthma. It is rather a wheezy, wailing sort of call." He said: "Yes, Leach's petrels seem tiny and elegant seabirds when compared with bonxies, so of course it can be difficult to watch a petrel get eaten without feeling some kind of regret. "Predation is a normal occurrence in nature though, even if rarely observed."